One of my favorite pieces in “Fragile Legacy,” a little glass anemone stuck to a rock. Shannon Leigh O’Neil and I recently took a long-planned road trip through New York’s Finger Lakes region to soak in some world-class art, science, nature and wine. 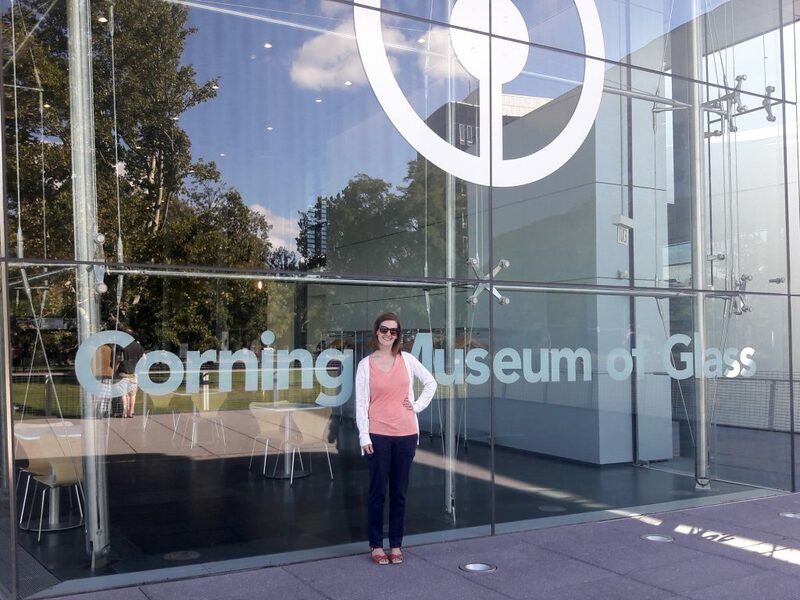 The first stop on our ambitious itinerary was the Corning Museum of Glass, a collection spanning 35 centuries of glassmaking, from utilitarian objects to fine art. The special exhibit I wanted to see was a bit of both. Ever since I saw Harvard University’s collection of glass flowers, I’ve been obsessed with the Victorian-era scientific glass models created by Leopold and Rudolf Blaschka. 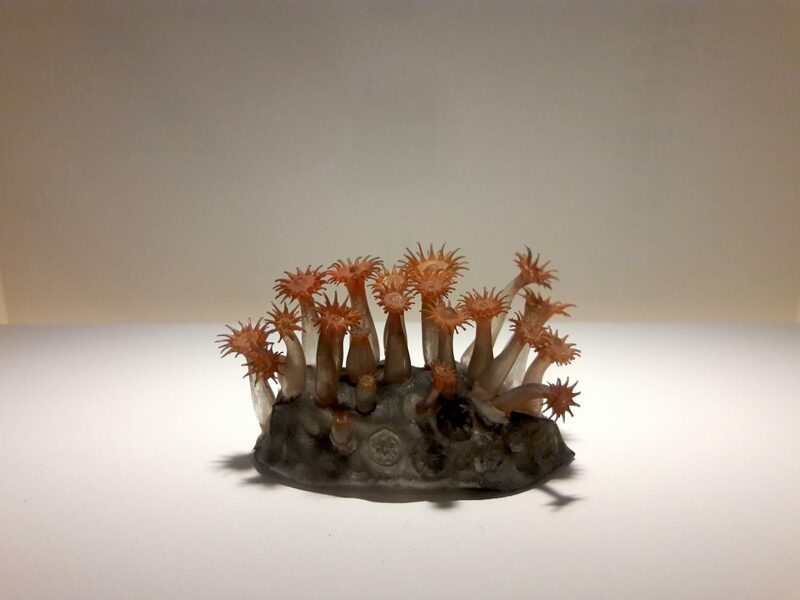 The Corning Museum’s exhibition, “Fragile Legacy: The Marine Invertebrate Glass Models of Leopold and Rudolf Blaschka,” presented scientific models of sea anemones, octopi, mollusks, and other animals, all created by the German glassmakers in the 1880s. But how did the land-bound Blaschkas design their marine invertebrates–which, if brought above the ocean’s surface, collapse into formless blobs–so accurately? The exhibit displays scientific illustrations of the animals that were published in 19th-century journals, which the glassmakers copied in colored pencil to improve their design. Then, with the proportions and shapes in mind, they reproduced their two-dimensional sketches in three-dimensional glass. 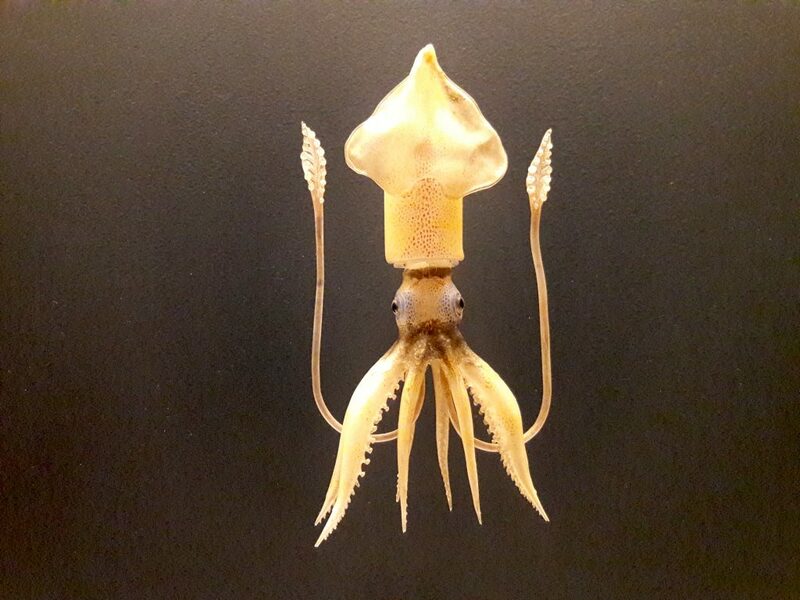 A neat little squid, made completely of glass! Amazingly, each glass model would be made to order and shipped in a specially padded box. To streamline production, the artists made tiny parts–miniscule eyes, single tentacles, and individual filaments, stored in matchboxes–so the glass models could be assembled quickly. A group of slender glass anemones on an anchor stone. 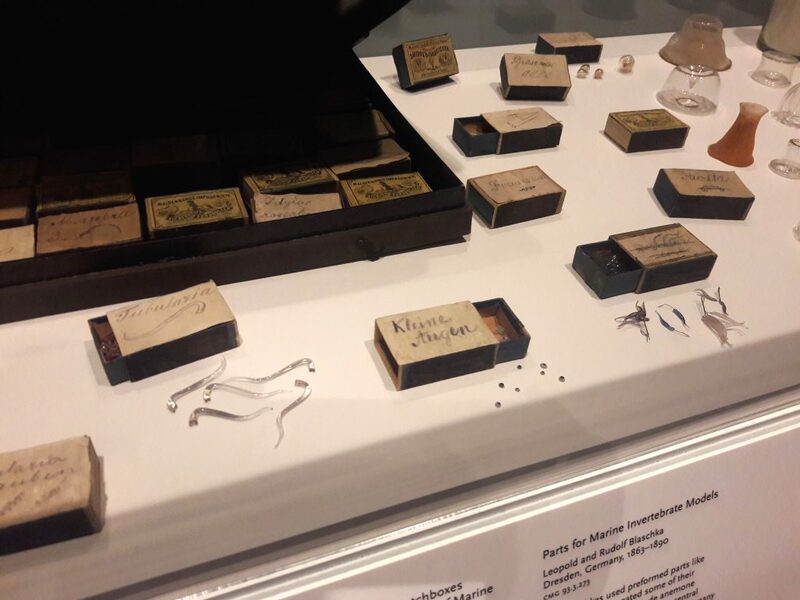 “Fragile Legacy” displayed a handful of the matchboxes’ goods, in addition to Rudolf Blaschka’s glassblowing table and several glassmaking tools. The real stars of the show, though, were the glass models themselves, molded and painted to look incredibly lifelike. 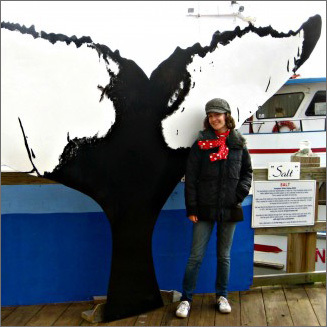 I could imagine the 125-year-old anemones’ tentacles wiggling in an oceanic current. The Blaschkas stored tiny components (foreground) of their glass models in these matchboxes, so assembling the made-to-order models would be easier. Researchers at Cornell University, which loaned most of the models to the exhibit, are now using the collection as a roadmap to assess some of the shifts in biodiversity between the Blaschkas’ time in the late 19th century and today. 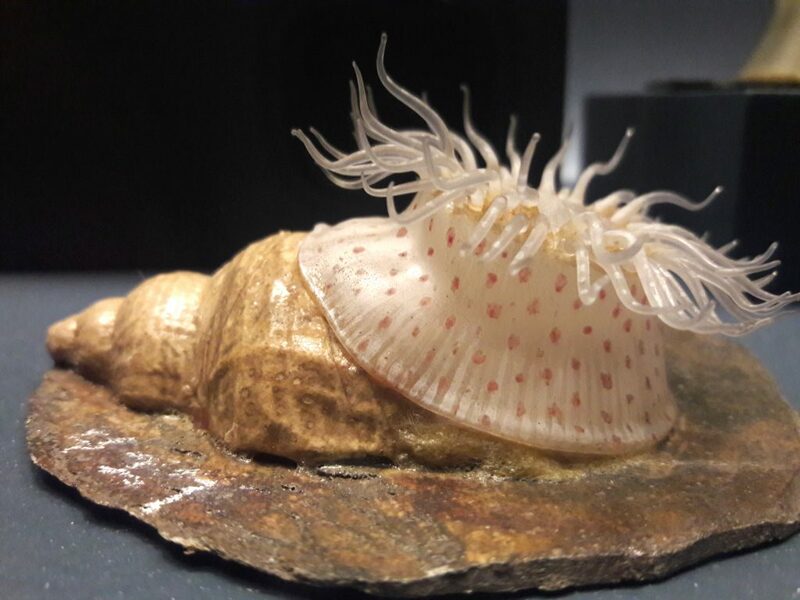 “We hope to find out whether they are surviving in the sea as magnificently as they do in glass,” says Drew Harvell, a professor and curator of the Cornell Collection of Blaschka Invertebrate Models, in a statement. A collection of 18th- and 19th-century whale oil lamps. One of the museum’s permanent exhibits, showing the development of glass and glassmaking over the past 3,500 years, was just as enthralling as the Blaschka glass models. 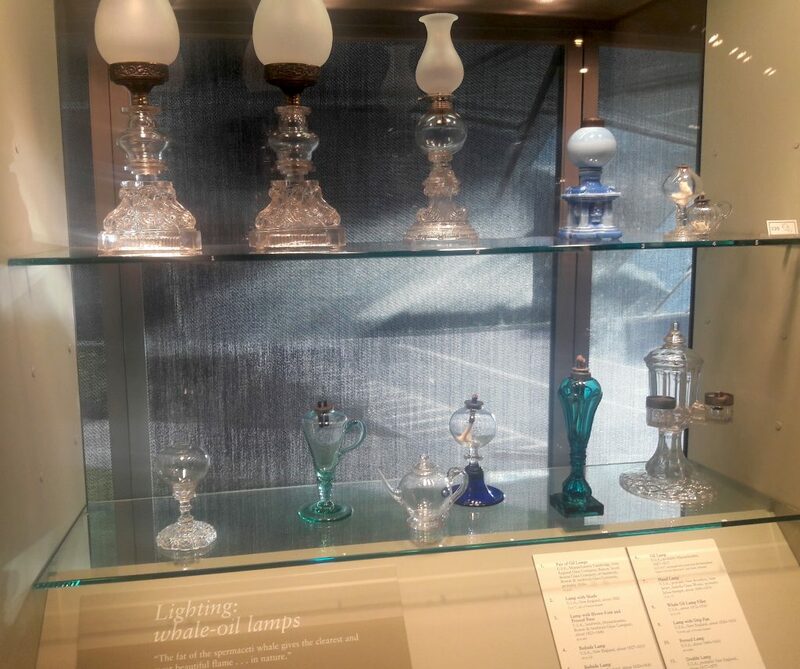 I naturally gravitated to a case of 18th- and 19th-century whale oil lamps, and discovered “forest glass,” a type common in medieval Germany and so called because the minerals in the glass gave it a loamy green hue. On the other end of the timeline, Shannon and I loved the naturalistic forms of the Art Nouveau vases and lamps. The Blaschka glass models in “Fragile Legacy” will be on view until January 8, 2017. I recommend it highly!